Wo warst Du? | Where were you on September 11th? Hatten Sie die Fotos zuvor schon einmal öffentlich (bzw. im Netz) gezeigt? Die Fotos der Ausstellung “Eine Woche im September 2001” in der Patton Stiftung: Sustainable Trust zeige ich 2011 das erste Mal öffentlich (13.08.-03.10.2011). Gezeigt werden 50 ausgewählte Fotodrucke; insgesamt sind es mehr als 200 Fotos – alle Aufnahmen sind in New York in der Zeit 08.-16.09.2001 analog entstanden, die Negative digital eingescannt. Bei der Ausstellungseröffnung am 13.08. und danach wurde ich wiederholt gefragt: Warum hast Du die Fotos erst 10 Jahre nach dem 11. September veröffentlicht? Eine verständliche Frage. Karl Stasche on Wo warst Du? | Where were you on September 11th? Claudia on Wo warst Du? | Where were you on September 11th? M. Retza on Wo warst Du? | Where were you on September 11th? Stefan D. Beyer on Wo warst Du? | Where were you on September 11th? Stefan on Wo warst Du? | Where were you on September 11th? Martin on Wo warst Du? | Where were you on September 11th? Wagner Wolf on Wo warst Du? | Where were you on September 11th? Thomas Wulf on Wo warst Du? | Where were you on September 11th? Stefan Recker on Wo warst Du? | Where were you on September 11th? Kai on Wo warst Du? | Where were you on September 11th? Alexander Klemm on Wo warst Du? | Where were you on September 11th? Anja on Wo warst Du? | Where were you on September 11th? Tanja Schmitt - Blasius on Wo warst Du? | Where were you on September 11th? Matthias on Wo warst Du? | Where were you on September 11th? Jo on Wo warst Du? | Where were you on September 11th? So on Wo warst Du? | Where were you on September 11th? Susi on Wo warst Du? | Where were you on September 11th? Markus B. on Wo warst Du? | Where were you on September 11th? Joachim Kreutzer on Wo warst Du? | Where were you on September 11th? JoNiess on Wo warst Du? | Where were you on September 11th? Adrian on Wo warst Du? | Where were you on September 11th? Gerrit on Wo warst Du? | Where were you on September 11th? Victoria on Wo warst Du? | Where were you on September 11th? anonymous on Wo warst Du? | Where were you on September 11th? Jacimat on Wo warst Du? | Where were you on September 11th? Marquardt on Wo warst Du? | Where were you on September 11th? Yannik on Wo warst Du? | Where were you on September 11th? Christel Reinhardt on Wo warst Du? | Where were you on September 11th? Martina on Wo warst Du? | Where were you on September 11th? Nadine on Wo warst Du? | Where were you on September 11th? Andreas on Wo warst Du? | Where were you on September 11th? Nathalie Karg on Wo warst Du? | Where were you on September 11th? Philipp on Wo warst Du? | Where were you on September 11th? Joachim Niess on Wo warst Du? | Where were you on September 11th? Andreas P. Bergweiler on Wo warst Du? | Where were you on September 11th? Andreas H. on Wo warst Du? | Where were you on September 11th? Dietmar Urban on Wo warst Du? | Where were you on September 11th? AM on Wo warst Du? | Where were you on September 11th? Sabine Schmitt on Wo warst Du? | Where were you on September 11th? Guido on Wo warst Du? | Where were you on September 11th? Vicky on Wo warst Du? | Where were you on September 11th? andrea on Wo warst Du? | Where were you on September 11th? Robertus Koppies on Wo warst Du? | Where were you on September 11th? Michael Berking on Wo warst Du? | Where were you on September 11th? Georg Pestal on Wo warst Du? | Where were you on September 11th? Katharina on Wo warst Du? | Where were you on September 11th? Roger on Wo warst Du? | Where were you on September 11th? Katie harris on Wo warst Du? | Where were you on September 11th? laura on Wo warst Du? | Where were you on September 11th? Kinga on Wo warst Du? | Where were you on September 11th? Petra on Wo warst Du? | Where were you on September 11th? Elefant on Wo warst Du? | Where were you on September 11th? Ulli D. on Wo warst Du? | Where were you on September 11th? Jens on Wo warst Du? | Where were you on September 11th? Open Data – private Erinnerungen: Eine Woche im September 2001 at Information and Web Science on Wo warst Du? | Where were you on September 11th? W3C Deutschland/Oesterreich » #OpenData – Social Sharing – Fotos des 11. September @ReinhardKarger on Wo warst Du? | Where were you on September 11th? Espen Vestre on Wo warst Du? | Where were you on September 11th? Matthias M. on Wo warst Du? | Where were you on September 11th? Daniel on Wo warst Du? | Where were you on September 11th? Tobias on Wo warst Du? | Where were you on September 11th? Steffen on Wo warst Du? | Where were you on September 11th? Frank Oelschläger on Wo warst Du? | Where were you on September 11th? Stephan Weitzel on Wo warst Du? | Where were you on September 11th? Nicky on Wo warst Du? | Where were you on September 11th? Gerd Hildebrandt on Wo warst Du? | Where were you on September 11th? Edi on Wo warst Du? | Where were you on September 11th? Anne on Wo warst Du? | Where were you on September 11th? Frank on Wo warst Du? | Where were you on September 11th? Thomas on Wo warst Du? | Where were you on September 11th? Nicki on Wo warst Du? | Where were you on September 11th? Lothar Schaaf on Wo warst Du? | Where were you on September 11th? Wolfgang Barth on Wo warst Du? | Where were you on September 11th? Christian on Wo warst Du? | Where were you on September 11th? Iris Schmidt on Wo warst Du? | Where were you on September 11th? Bettina on Wo warst Du? | Where were you on September 11th? Falzone Orazio on Wo warst Du? | Where were you on September 11th? Cristina Schaaf on Wo warst Du? | Where were you on September 11th? Carsten Buch on Wo warst Du? | Where were you on September 11th? Helen Patton on Wo warst Du? | Where were you on September 11th? Kat on Wo warst Du? | Where were you on September 11th? Peter Appelius on Wo warst Du? | Where were you on September 11th? Melanie P. on Wo warst Du? | Where were you on September 11th? Beate Eickelmann on Wo warst Du? | Where were you on September 11th? Silke Grawunder on Wo warst Du? | Where were you on September 11th? Altmeyer Jörg on Wo warst Du? | Where were you on September 11th? Kornelia on Wo warst Du? | Where were you on September 11th? Norman Stuber on Wo warst Du? | Where were you on September 11th? Wo warst Du am 11. September? | Incetrix on Wo warst Du? | Where were you on September 11th? T. Zimmermann on Wo warst Du? | Where were you on September 11th? Christoph Endres on Wo warst Du? | Where were you on September 11th? Ramona Servatius on Wo warst Du? | Where were you on September 11th? Martin Riemer on Wo warst Du? | Where were you on September 11th? K.Göpfert on Wo warst Du? | Where were you on September 11th? Anonym on Wo warst Du? | Where were you on September 11th? Eva on Wo warst Du? | Where were you on September 11th? Kurt on Wo warst Du? | Where were you on September 11th? Birgit on Wo warst Du? | Where were you on September 11th? Alex on Wo warst Du? | Where were you on September 11th? Maike on Wo warst Du? | Where were you on September 11th? Paul Schreiber on Wo warst Du? | Where were you on September 11th? Peter Payne on Wo warst Du? | Where were you on September 11th? Suse Janke on Wo warst Du? | Where were you on September 11th? U. Penski on Wo warst Du? | Where were you on September 11th? Nina B. on Wo warst Du? | Where were you on September 11th? Sabine on Wo warst Du? | Where were you on September 11th? Daniele on Wo warst Du? | Where were you on September 11th? Volker on Wo warst Du? | Where were you on September 11th? Adam on Wo warst Du? | Where were you on September 11th? Meli on Wo warst Du? | Where were you on September 11th? Enrico Merazzi on Wo warst Du? | Where were you on September 11th? Andreas R. on Wo warst Du? | Where were you on September 11th? Michael Schenk on Wo warst Du? | Where were you on September 11th? Wolfgang on Wo warst Du? | Where were you on September 11th? Lilian on Wo warst Du? | Where were you on September 11th? TraXim on Wo warst Du? | Where were you on September 11th? Manuela on Wo warst Du? | Where were you on September 11th? Beate on Wo warst Du? | Where were you on September 11th? Richard on Wo warst Du? | Where were you on September 11th? Jörg Aumann on Wo warst Du? | Where were you on September 11th? José Mónica on Wo warst Du? | Where were you on September 11th? Daniel Sordon on Wo warst Du? | Where were you on September 11th? Kobayashi on Wo warst Du? | Where were you on September 11th? Katja Scheller on Wo warst Du? | Where were you on September 11th? 9/11 – Der Tag, an dem die Erde stillstand on Wo warst Du? | Where were you on September 11th? Esther Wagner on Wo warst Du? | Where were you on September 11th? Clara on Wo warst Du? | Where were you on September 11th? evelyn coviello on Wo warst Du? | Where were you on September 11th? Christine on Wo warst Du? | Where were you on September 11th? Henrike Bremm on Wo warst Du? | Where were you on September 11th? Katina Banks on Wo warst Du? | Where were you on September 11th? benjamin on Wo warst Du? | Where were you on September 11th? G. Engel on Wo warst Du? | Where were you on September 11th? Regina on Wo warst Du? | Where were you on September 11th? M.Lash on Wo warst Du? | Where were you on September 11th? Detlef Krüger on Wo warst Du? | Where were you on September 11th? Horst Pachulke on Wo warst Du? | Where were you on September 11th? C.D. Feederle on Wo warst Du? | Where were you on September 11th? Markus on Wo warst Du? | Where were you on September 11th? Chris on Wo warst Du? | Where were you on September 11th? Pauline on Wo warst Du? | Where were you on September 11th? Peter Schwitalla on Wo warst Du? | Where were you on September 11th? Susanne on Wo warst Du? | Where were you on September 11th? stern.de “Der Tag, der unsere Welt veränderte” | Eine Woche im September 2001 on Wo warst Du? | Where were you on September 11th? SchweizerSchoggi on Wo warst Du? | Where were you on September 11th? Michael H. on Wo warst Du? | Where were you on September 11th? Denise P. on Wo warst Du? | Where were you on September 11th? Deborah on Wo warst Du? | Where were you on September 11th? Tanja on Wo warst Du? | Where were you on September 11th? John on Wo warst Du? | Where were you on September 11th? Patrick R. on Wo warst Du? | Where were you on September 11th? Kerstin Krüger on Wo warst Du? | Where were you on September 11th? Sharon on Wo warst Du? | Where were you on September 11th? Klaus Schaaf on Wo warst Du? | Where were you on September 11th? Vitsing on Wo warst Du? | Where were you on September 11th? darryl hall on Wo warst Du? | Where were you on September 11th? Nini on Wo warst Du? | Where were you on September 11th? 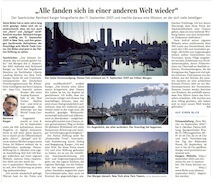 The Last Sunrise Between the Twin Towers – Spiegel Online | World Trade Center Complex on Wo warst Du? | Where were you on September 11th? Gabriele Dathe on Wo warst Du? | Where were you on September 11th? Michael Nebel on Wo warst Du? | Where were you on September 11th? Bernd Bertelmann on Wo warst Du? | Where were you on September 11th? A Unique Perspective on Sept. 11 « HoangKyBacTien's Blog on Wo warst Du? | Where were you on September 11th? Kerstin Honer zu Bentrup on Wo warst Du? | Where were you on September 11th? Sebastian on Wo warst Du? | Where were you on September 11th? Selina on Wo warst Du? | Where were you on September 11th? JBS on Wo warst Du? | Where were you on September 11th? Ralf on Wo warst Du? | Where were you on September 11th? Birgit H. on Wo warst Du? | Where were you on September 11th? Marie-Theres on Wo warst Du? | Where were you on September 11th? Nicole B. on Wo warst Du? | Where were you on September 11th? Simone L. on Wo warst Du? | Where were you on September 11th? Bianca on Wo warst Du? | Where were you on September 11th? Nicole L. on Wo warst Du? | Where were you on September 11th? Hermann Niehus on Wo warst Du? | Where were you on September 11th? Funke A. on Wo warst Du? | Where were you on September 11th? Häusler Eva-M. on Wo warst Du? | Where were you on September 11th? Eva Bolz on Wo warst Du? | Where were you on September 11th? Carol Hall on Wo warst Du? | Where were you on September 11th? Frank Heitkamp on Wo warst Du? | Where were you on September 11th? Sven Prüser on Wo warst Du? | Where were you on September 11th? Friedrich S. on Wo warst Du? | Where were you on September 11th? Almuth Hauptmann-Gurski on Wo warst Du? | Where were you on September 11th? Veronika Rass on Wo warst Du? | Where were you on September 11th? Basti on Wo warst Du? | Where were you on September 11th? Fred George on Wo warst Du? | Where were you on September 11th? Krissie on Wo warst Du? | Where were you on September 11th? Scheidig H+G on Wo warst Du? | Where were you on September 11th? Britta on Wo warst Du? | Where were you on September 11th? Johannes Backes on Wo warst Du? | Where were you on September 11th? Eine Woche im September « Bachmichels Haus on Wo warst Du? | Where were you on September 11th? Michael Illich on Wo warst Du? | Where were you on September 11th? Tamara on Wo warst Du? | Where were you on September 11th? Heike Leonhard on Wo warst Du? | Where were you on September 11th? Kathrin Lenz on Wo warst Du? | Where were you on September 11th? Luigi FUSCO, ESA on Wo warst Du? | Where were you on September 11th? Boris Behncke, Catania, Italien on Wo warst Du? | Where were you on September 11th? Bibi on Wo warst Du? | Where were you on September 11th? Stephan Busemann on Wo warst Du? | Where were you on September 11th? Heinrich Großbongardt on Wo warst Du? | Where were you on September 11th? johannes karger on Wo warst Du? | Where were you on September 11th? Thomas O. on Wo warst Du? | Where were you on September 11th? Michael Wolf on Wo warst Du? | Where were you on September 11th? Felix on Wo warst Du? | Where were you on September 11th? Christine Enzel on Wo warst Du? | Where were you on September 11th? Jeannette on Wo warst Du? | Where were you on September 11th? Silke on Wo warst Du? | Where were you on September 11th? Michael B. on Wo warst Du? | Where were you on September 11th? Siegfried Riecker on Wo warst Du? | Where were you on September 11th? Blu-Skyy on Wo warst Du? | Where were you on September 11th? Jana on Wo warst Du? | Where were you on September 11th? Martin Reiser on Wo warst Du? | Where were you on September 11th? Boris on Wo warst Du? | Where were you on September 11th? Andreas K. on Wo warst Du? | Where were you on September 11th? GL on Wo warst Du? | Where were you on September 11th? annette on Wo warst Du? | Where were you on September 11th? Lieber Anonym on Wo warst Du? | Where were you on September 11th? Tina on Wo warst Du? | Where were you on September 11th? Karsten on Wo warst Du? | Where were you on September 11th? Max on Wo warst Du? | Where were you on September 11th?